Not so long ago, spray-n-pray marketing used to be our go-to option for marketing. But today, personalization has become the new norm. Moreover, factors like user behavior tracking, rich customer data, sophisticated marketing automation tools etc. have enabled us to take the communication beyond Hello <first_name>. In this webinar, we will help you upgrade from Basic Personalization techniques to Hyper–Personalization techniques using the simple drag-n-drop features of WebEngage. If you are a data-driven Campaign Manager / Marketing Manager / Product Manager who is convinced that personalized engagement is fundamental to retention marketing, then this webinar is for you. Avantika: Thank you for your patience. Hello and welcome to this webinar by WebEngage. My name is Avantika Pandey. I’m the Community Manager at WebEngage and the moderator for today’s webinar. Before we get started, allow me to cover few housekeeping topics. First, during the webinar, you’ll be on the Listen Only mode. Second, if you have any question, please type it in in the Comment box below. We’ll address as many of those as possible by the end of this presentation. Third, today’s webinar is being recorded and we’ll make the recording available here. Fourth, we would really appreciate your feedback on today’s webinar. Please spare few minutes to fill the survey which we’ll send out after this webinar. Now, so those who don’t know, WebEngage is a marketing cloud for consumer businesses. More than 40,000 online businesses trust us to automate their retention marketing using multiple channels of engagement across email, web and mobile, and the campaigns are not only targeted but also personalized. When we started working on this webinar we realized that spree and pre-marketing is prevalent everywhere and these were in form of bulk email and push notifications which just followed like generic one-message-fits-all approach. Now for your brand to stay relevant, it’s highly imperative to personalize your engagement strategies across channels, and these numbers support the same. 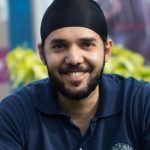 Today, Sameet Singh, the product manager at WebEngage, will show you how you can level-up from basic to hyper personalization for increased conversion and better top-line, and make it as easy as drag and drop with the help of WebEngage. Over to you, Sameet. Sameet: Okay, thank you so much, Avantika. Thank you everyone for listening in. We’re getting record attendance today which is very heartening thing to see because the subject is personalization. And at WebEngage we really believe that personalization is the bedrock of any modern multi-channel marketing and product communication strategy which is call to retention and eventually growth. So thank you all for your time and I would just like to clarify that this webinar is gonna be far less theoretical and centered around the, “why” of you should be doing personalization. We’re assuming you’re already on the bandwagon. 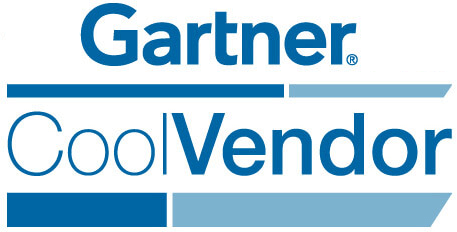 You all understand the importance and relevance of personalization in modern day marketing. Today’s webinar is gonna be focused around actionable things that you can take back and start using right away. We’re gonna be demonstrating most of the time. And so today is gonna be “how to” rather than “why to.” If you’re interested in the conceptual implications of personalization and you still need convincing on why you should be doing personalization in the first place, we have done the webinar recently. It was done by a guest host, Mr. Jim Poage, and you can access that webinar and actually much more on our YouTube channel. So hi, everyone. Some of you might actually recognize this from an email that you have received yesterday. And to begin with we’d just like to give you like a tip on what not to do. So whenever you try to do personalization on the basis of data that you’re collecting, always make sure that you are falling back to a default or a scenario or you can at least think about the scenario where, if that data, if it is missing, how would your message look in that case and provide defaults if applicable. So with that message out of the way and with that context set that this webinar is basically gonna be a how-to, let’s quickly run through the agenda. 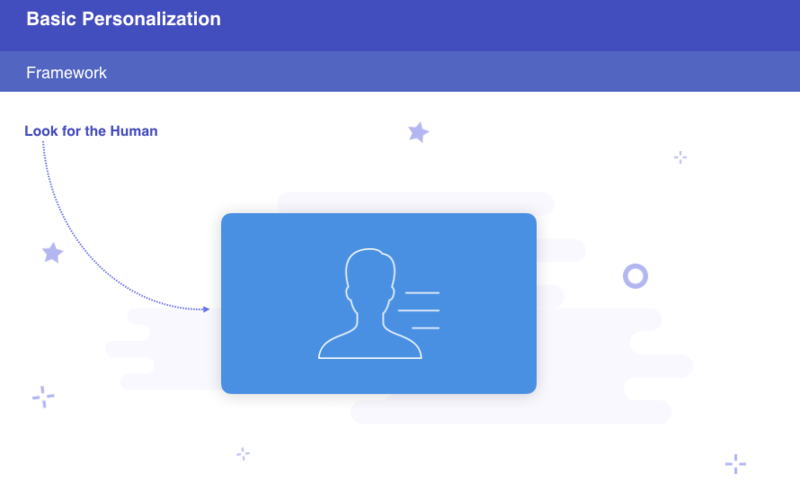 We’re going to go over the basics of how you can personalize your cross-channel campaigns using WebEngage so simple personalization which fall back or which rely on user attributes like first name, gender, location, and so on. We’ll also tell you about how you can make your campaign content so much more contextual using users’ behavioral data as well. So the actions that they’re performing in your applications, adding things to cart, searching for something, clicking on a button, abandoning a purchase and so on. Any behavior that they express which is of interest to your business and which is actionable can be picked up and used for personalization of all campaigns across WebEngage. The basics out of the way, we’ll be going through advanced personalization where we’d be actually telling you how you can personalize on the basis of data that WebEngage doesn’t even have stored. Also if there’s data that falls or that resides on your CRM or recommendation engine, or any third-party data store, how would you in real-time connect to that data store, fetch data, and use it in any cross-channel campaign will also be demonstrated. We would also run you through how you can create complicated conditional data blocks, so if a certain condition is true, only then include this block of data, something like that. We’ll also show you how you can use lists of items and loop over the data and print them in your engagements network. We’ll run you through a case study, a real-world case study that we did with a client which got tremendous results. So we’ll actually proved what we are preaching today and we’ll throw open the floor for questions and answers. So just to keep the lecture or the theory as minimal as possible, I’d just like to address one topic here. Personalization is actually a very broad term. So from an end user’s perspective who’s receiving your communications, receiving the campaigns that you create, it’s actually quite simple. All that they expect is that if a brand is reaching out to them, the communication be contextual, the communication be well timed, so it should be more inclusive, and the data that you put in or the messaging that you put in should be relevant and should resonate with the people that you’re trying to reach out to. So human-centered and humanized communication is the only expectation that your consumers have. From a marketer’s perspective this might actually end up translating into a gamut of things. This means that your campaigns need to be segmented which means that they’re going out to the right subset of people. It could also mean that the campaigns need to be triggered which means that they don’t always be blasts. They instead go out at the right time or the opportune moment, and it could also mean that the content of the campaign itself is individualized and the content is for consumer personalized. And the focus of this webinar is on this last bit, individualization or personalization within the context of the campaign content itself. All right, so we’ll get to it. So a personalization engine is basically channel agnostic. So WebEngage as you know is a multi-channel marketing automation suite and you’ve got emails, mobile push, browser push, In-App messages, and SMS are the channels that you can engage with your users on. 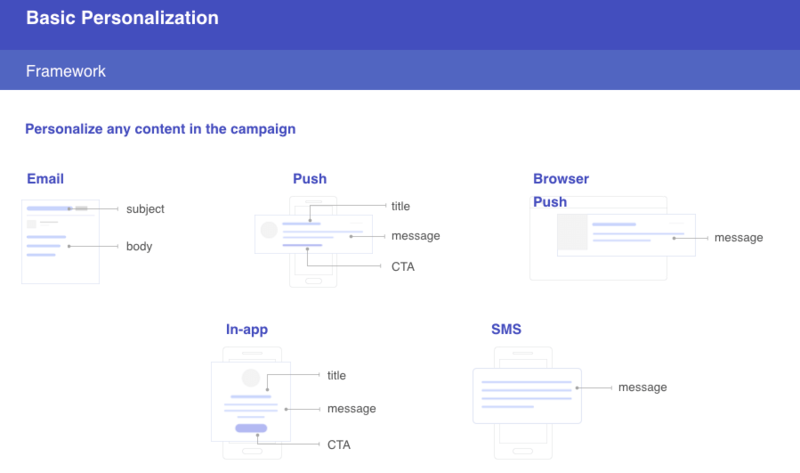 But underlying personalization engine is built in a way that it does not care which channel the message is being sent on, the same capabilities and the same plethora of personalization variables that are available to you across all of these channels. So you can personalize anything from the email subject, the body through the button labels, to the call to action links, anything which is textual or which can be depicted textually like the image URLs can be personalized regardless of the channel. So they say that personalization is about humanizing your campaigns, right? So it’s only logical that to personalize your campaigns in WebEngage you basically look for the human. So this icon is your lead-in to the gamut of point-and-click personalization abilities that you get on WebEngage. Remember, to personalize in WebEngage, you look for the human. Okay, so let’s go over a few examples. Let’s say you’re an online travel agency and you’re designing a campaign to recover abandoned searches. So if we were to draw this on a whiteboard we would say when the user searches the flight, we basically wait for them to book it or complete the transaction for up to 30 minutes. And if that doesn’t happen, if it’s an abandoned search, we basically try to recover or retain that lead by sending them a subtle nudge. Now let’s see in our scenario, though it’s not just gonna be a web or push notification. Now if you were doing such a campaign today without any personalization, you can only get so far as a generic message like this. You’re booking away. It’s “Click here to continue” your transaction or booking. Now I would give it to you that this is still personalized to some extent. This is contextual. This is in the mindset of a customer who’s abandoned the search. So this will still resonate with them. But the message and the content itself is still generic. So, let’s try to increment improve them. For starters, how about we just say, “Hi, John,” or “hi, first name?” Mind you with the default, “Click here to continue your booking.” Let’s just go for this. So, let’s switch over to the demo mode now and I’ll run you to how you can achieve this. Okay, so this is the same scenario that we are trying to basically personalize for. Let’s say they’re sending a push notification. Let’s go into the composition of the push message itself and you’ll notice that right now it stands at the generic message that we saw. Just give it a moment. Okay, so your flight awaights. Click here to continue your booking. Let’s, just for starters, try and make it a tad bit more personal. So let’s say we wanna personalize the title. Come over here. The instinct here is that I want to use the user’s first name in order to try and grab his attention up front. So what I wanna do here is that in the title field I want to say, “Hi,” first name, or, “Hi, John,” in case of a sample user. So following my instinct, I will say, okay, “Hi,” and now here I want to use some data which I probably already have. Now the way that you would get to that is by…remember what I told you? Looking for the human. So you would find the human at most places where you would anticipate needing him. Click on the human and you’ll find a couple of options and I will go over these. You’ll see three buckets. The first one is user data, any profile data that you might have captured, and the other two are behavioral data that have been captured, any actions or events that the users may have done. So assuming that the data has comes in, it is accessible to you in this personalization menu. The lead then is the human, remember. You could go into the first bucket, User, and you could basically see all the user attributes we have ever collected or you have ever asked. So this is a list that is made available to you in a platter up front. So all I want right now is the users’ first names. All I do is I point, I click, and the result as you see on the right is personalized. So I’m looking at the period for the sample user and this would basically mean that whichever user this method goes out to, their first name is gonna be substituted. And just to not make the mistake that we did when we invited you into this webinar, you would always want to fall back to a default right? So in case the user’s first name is not found, let’s say you would say…okay, I wanna say, “Hi there,” just to make it agnostic of whether or not the data actually exists in your database. So taking that out of the way for now. Once again just to recap, I would go into the human. I would take help from the human. I would go into the user profile bucket, and I see a plethora of user attributes available to me. I would pick the one which is of interest and, voila, my message is personalized, right? Let’s say we wanna say, “Hi, Shawn. Your flight awaits, da da da.” If I move on to the message I see that the human is available here as well to help me out. Let me just leave this be for now. Let’s say I just wanna make this a little more attractive visually, so I’ll probably put in generic flight image if I could because we wanna do better but let’s just start with the basics here. So, “Hi, John. Your flight awaits,” and a slightly visual message just to try and grab attention. So that’s how far we could get with a simple user profile-driven personalization effort. Mind you, this personalization token is available at a lot of other places as I told you. So it could be used in deep-links. It could be used as labels of call to actions, and so on and so forth. Anything which is textual or which can be represented textually can be personalized using the human. Okay, all right. So this message is fine. It’s good for a start but it obviously be a little more contextual, right? So we’re sending it then somebody abandons their booking which means there is a certain amount of behavior that we’ve captured. They were trying to look for a flight. They were trying to book something. And that action did not translate into the result that we wanted. But what the user left behind, what the imprint that he left behind could still be actionable to us because we could use the data that the user left behind for us to further personalize this message in order to improve our chances of emotionally connecting with the user and sort of nudging him to an action that resonates with him. So, how about we now attempt to do something like this? We’ve done this. Now let’s try and get to a stage where we do something like this: “Shawn, only three tickets are left for your flight from so on and so forth. And the departure is so and so date.” As much context as possible which would resonate and maybe create a sense of urgency, and first we grab attention and then try to evoke action. Let’s try and fit all of that. Let’s try and get to that now. So instead of, “Hi, John,” we’re gonna go for this, okay, “John…” Let’s say we wanna say, “Only three tickets left,” right? Okay, so, “Only dash tickets left.” Now, again, I have run into a scenario where I wanna use some data which I possibly already have captured. So the data that I want this time is behavioral data which is basically the search that the guy had done, that the user had done. I want to pick up some context from there. So there’re two options there that you can sort of go to to get that data, event and journey or lifecycle related events. Both of these are basically actions that the user is taking. If you go into this sub-option, into this bucket, you’ll see a list of all possible events which are available to you and selecting something from here will basically mean you are interested in the latest occurrence of the event that the user has done. Whereas selecting an event from this particular bucket, the lifecycle bucket of the journey bucket, basically means that now I’m in this campaign, I’m in this life cycle flow for the user. This flow was started by a very specific event by a very specific flight search and I want to refer to that particular search and fetch data from that behaviour, right? So we’re gonna use this for now. Let’s say we want to figure out how many tickets are left. Now assuming this event has been passed by you to us in real-time, flight searched, what you would also do is along with the occurrence of this event you would also attach a fair amount of meta-data related to that event. So information about the event, so what was the flight search about, what was the departure city behind exactly, the time, the type of the class, whether a coupon was applied? Any business information which is of interest to you, you would basically try to capture the essence of that in the actions that you’re capturing as events. So flight search being an event that you’re capturing would attach these attributes and whatever makes sense to your business. So here, for example, you wanna pick how many tickets are left, right? So if that’s what we wanted to do, assuming they’ve passed that data along to WebEngage, only X amount of tickets left, let’s say we just point and click on that attribute, again, it’s just one template. Once you’ve passed the data to us, the consumption is very simple. It’s point and click with the human. And, voila, if you notice, the preview shows you only three tickets left for the sample user that we are previewing it for. Now think about this for a moment. This is tremendous amount of power at your fingertips, right? Any behavioral data which is happening in real time is being captured and is available to you in a point-and-click approach to just use for extremely high touch personalized messages. So why stop there, right? That’s the title. So, “John, only three tickets left.” Let’s say now we want to complement this with, “Book your…” Okay, let’s say, “Book your…” Let’s say we wanna do departure to arrivals. So I’ll refer to the same event again, right? The one that he had searched for, the flight he searched for, and I would say…okay, let’s say I wanna do departure city. “So book your Frankfurt to the arrival city Hamburg flight for…” whichever was the date that the user basically wanted to travel on. And that’s it. It’s just point and click. So the essence is that the behavior has been captured, the associated data that you’d like to use has been captured and from there on it’s just that simple. And that’s a decent method I believe. Let’s just try and see if we can get the image to be a little more pertinent. Let’s say we said we wanna show the image of the destination that the guy is traveling to, or maybe we wanna show the image of the airline or the class that he wanted to book for, right? So, okay, so assuming he wanted to book like a Lufthansa flight, that data was captured in the event, such visualizations can also be personalized on the system. So that’s where we’ve reached. Now this is the next level. This is level two of personalization where you don’t just personalize on the basis of user profile data. You also use their behavioral attributes in real time to personalize and contextualize as much as possible, right? And by the way, as I mentioned, this ability is channel agnostic so I’m showing you a sample push notification but the same level of personalization, the same human is available to you in all channels that are available. Okay, so that’s a decent bit. Just to recap where we are so far, we’ve made friends with the human. We know he’s the one we look to to personalize. We know that we’ve got a lot of user profile attributes available for personalization. We know that we’ve got a lot of behavioral data that we can personalize on the basis of the latest event or a specific event in a life cycle. And the prerequisite to doing this is basically passing the data during integration to us in real time using our SDKs, and APIs, or the attributes, right? So all of this was personalization on the basis of data that you’ve captured inside the WebEngage ecosystem where you’ve helped WebEngage capture this data one way or another. What we also offer as the next step of personalization is personalizing your campaigns in real time on the basis of data that we don’t even have stored, right? So personalizing using external data which basically means that if you’ve got any data in your CRM, your data warehouse, and LMS, or a recommendation engine, or any other third-party data source that you want to pull into WebEngage just in time before you’re about to dispatch a campaign, that can also be done. It’s done using API-driven personalization. I’ll be showing you that shortly. And in this section I’ll also cover how you could use some complicated data structure that comes back to you using these API calls that you might want to use in your messages. For example, lists of products, or conditional data blocks, those will be covered in this sectio, okay? So let’s just continue on the use case that we were previously building on. So we ran a campaign for abandoners and because we took so much personal attention to them, let’s say a lot of them converted and once they’ve booked the flight because we were more greedy as brands, we wanted to try and upsell or cross-sell hotel bookings to them, right? So ideally what we want to do here is we still want to continue to stay as relevant as possible. We still want to resonate. It’s never gonna be batch and blast. So when the guy books a flight, ideally, if he has not already booked the hotel as well and maybe if he’s not driving back to his home city, we want to basically try and recommend hotels to him for his stay. And this hotel recommendation bit is possibly data that we don’t natively have in WebEngage but we’re gonna try and fetch it from a third-party system in real-time. So the outcome that you wanna get goes something like this where we again speak contextual language. So John booked a ticket to Hamburg. We recommend him hotels which are relevant to that particular area. 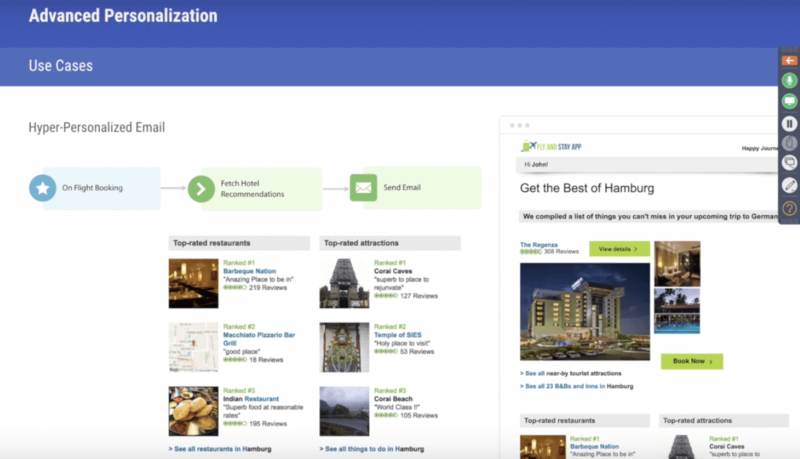 Now the magic is in the second step where we fetch hotel recommendations using our API personalization capabilities. Basically, conceptually what happens is when the user is in that stage of the journey, WebEngage would contact your Rest API enabled third party data store, could be a recommendation engine, could be anything. We basically talk to a third-party data store over typical Rest APIs. If the data store needs any context from us, like for example here we want hotel recommendations for the destination that the user is going to so destination is something that we would have to convey to the third-party data store before we get the appropriate response. So that conveyance, that context passing can be enabled using the personalization engine as well. Again, the human is gonna come to your rescue. And once we do that, once you pass that context along, we would get…we would expect the JSON response from that third-party data store, and the inner structure of the JSON is not…it’s extremely flexible. You can pass whatever you want as response so long as it is valid JSON and that data can then be passed and looked over and used inside of any campaign that you would be puling. Let’s actually look at that. If this is the email that you wanna send, this is what it would be loosely under the hood where a lot of the personalized content would be fetched using API recommendations that we’re gonna be pulling. So this is the same life cycle that we are continuing with. So once we actually send the push notification, we waited for them to complete the transaction and in this case we’re handing the scenario where the user actually ended up booking the ticket, right? We completed the check so the flight was booked. And then maybe two days before the departure date we want to send him this list of recommendations. Now mind you, this whole workflow that we are creating when I said two days before departure date, that is also extreme amount of personalization or rather contextualization capability that you’re getting here. So the concept is the same, instead of using this capability for content personalization, you’re using this for contextual personalization. So here you could also do things like if this is a business trip, we basically maybe want to send this a day in advance. If this is a holiday booking that the guy is doing which could be deduced from the departure and arrival dates, departure and return dates rather, so if it’s like a seven-day window, maybe we assume that it’s a leisure trip or a holiday and we want to reach out to them for a booking. We want to recommend that seven days in advance. So such kinds of personalization is also available to you, but maybe that’s best for another time. Let’s get back to the content personalization that we were doing, right? So just before we wanna send them an email, let’s say we want to send them hotel recommendations email at this opportune moment, just before we send the email we want to talk to the third-party recommendation engine and we want to fetch a list of recommendations. So let’s see how we would do that. Assuming this is like a dummy recommendation engine that we set up for the demo which is reachable and is particularly well, we’re hitting this recommendation engine. We’re making a great request to that recommendation engine. And if you notice here, what we did was we again looked for the human and we reached or we picked the booking event that happened, right? Enter the search event right now we’re interested in that booking event that happened. And from within the booking event we say, okay, whatever is the arrival city, that is the data that I need to send to my third-party data store so that it can return me the relevant recommendations in our list. So that is personalization as well. That’s personalization in a very different form but it’s extreme personalization which is very, very handy. So this request that you’re making, if there’s authorization required, all of that can also be taken care of. This is basically a simple HTTP – REST API get request that you’re creating and you’ve got complete flexibility here. So just to test whether this actually works or not, if you’re gonna hit this recommendation engine in real world, in real time, let’s say that the user actually is gonna go to Hamburg, let’s try and test if the actual data comes back to us. And yes it does. So here is the kind of response that they’re getting back, right? It’s basically a list of hotel recommendations. It’s a valid JSON. It’s an array of hotel objects and they contain a lot of metadata about the hotel that we might want to use. In the subsequent message, we’ll get how we can use that while we just tested for a few other scenarios, does it work for other places as well. Yes, it does. Okay, awesome. So assuming that this is gonna work, let’s see how we can actually use this API response in real time in the subsequent campaigns that we’re going to go. Let’s open up the email. Now so in the interest of time, I basically put in the shell structures of the mock-up that you would need to put for like a responsive and friendly email. Ignoring all of that, let’s look at the personalization capabilities that we have used. So let’s start with the subject, right, because why not? So here there’s this weird cold structure that comes about which says, “If there is such a thing as an arrival city, if I have that data, then I use it in the subject line. I say ‘still searching for hotels’ in that very same arrival city.” Now the way that this subject was curated is again basically you point, click, select, and personalize, right? Still looking for hotels. If that travel city data is not there we generalize it for that fall back scenario. This can actually be done in a couple of ways. Here’s one. Now if you notice in the human, the human this time has a little bit more to offer us. If you notice, there’s a call in API option available as well. So we included an API step and basically the data that comes back or is expected back from that is also made available to us in a point-and-click map. So, again, if you wanted to use hotel data, you would click away at this point, click personalize technique and we would use the inner data which is something inside of those objects. Let me quickly show you that. So there’s a couple of examples that I’d like to highlight here in the content of the email itself. So for the link that you’re curating, somewhere along the line in the email there’s a link that takes you to a landing page of all hotels in the corresponding destination. So if you notice that this link is also hyper personalized, you’re actually picking that arrival city data and transforming it in some manner. You are picking that data, converting it into lowercase, replacing any spaces by hyphens. So you’re basically doing a little bit of programming but relatively simply in order to create like a URL friendly version of the data that you’ve captured. And all of this capability that you are seeing, right, this portability, the one that you saw above as well that you saw or this transformation that you’re seeing or the loop that you’re about to see down below, all of that is courtesy of templating engine that we use. The templating engine is called Nunjucks and it’s an extremely capable templating engine. And you can obviously go to the documentation of the engine itself to understand what code ability is available to you. Typically you would end up using IF locks and loops in order to print out lists of items or maybe you would want to use things that allow you to do fall backs. Sometimes you might want to transform your data just like we were doing right now, converting it into lowercase and replacing spaces by hyphens and so on and so forth. So all of that capability is available to you inside of this email designer. And just to go over the actual looping itself, so this is again some data block that you want to conditionally include, right? So if my API responded with a certain data point, in this case the amount of balance that I have in my wallet, if that data is available, I would possibly include another content block which would resonate with the back user. If it isn’t available, this data block will basically be ignored. So those kind of abilities. And finally we get to the looping capability where in the list of hotels that we get back, we basically loop over that list. We ensure that we don’t go more than seven. We don’t wanna recommend more than seven or an arbitrary number of hotel recommendations. And we basically list out a little bit of metadata that came back from that API response. So we are looping over the hotel list that we got and for every item, for every hotel, you’re saying I wanna print out the hotel name in this manner, I will use all that URL in this manner and so on and so forth. So what visual structure you create is completely up to you. All of that is also personalizable using search dynamic code constructs which is courtesy of the Nunjucks templating engine. So that is basically how you would use the data that comes back from your API, and it’s also how you would use any complicated data or any sort of list type of data, conditional data that may come back from your API. So those are the advanced API-driven personalization capabilities and whatever we’ve conveyed to you so far, whatever we’ve demonstrated is actually not fluff that we’ve pulled out of our…which we pulled out of thin air. This is actually validated stuff which has run in the real world and has done well. So Goibibo is one of our customers in the OTA space and they actually did something very similar as hyper personalization. So the marketing team there wanted to engage with these abandoners in a very personalized manner and the intention was of course to retain them and eventually also try and upsell and so on. So they created a journey of this manner, a workflow of this manner. Extremely…very very similar to what we created, just a few more scenarios that they handled in case there’s no emails and they do something else. If the campaign has already gone, they don’t want to over communicate so they prevent that. So all of that aside, this is basically what we demonstrated previously. And the outcome or a sample of the content rich…personalized content that they could create was of this nature. The search context was in the subject, any CRM related data was being used in the body of the email. Multiple API responses were being used in order to further personalize and conditional data blocks and lists of data were being fed in to basically make the structure and the content extremely rich and one that would resonate and evoke, right? The results were of course favorable and they actually tested it with multiple variants in the subject lines forming the body of the content itself. And you’ll notice that the one at the top and bottom, the ones with the most context and the ones which were extremely easy on the eye are basically given the best open rates and click throughs and conversion rates. So this testability is actually also packaged in the product, will probably hold another on that subject. So that was basically all we had to share in terms of the how-to personalize, and that being validated with the real-world case study as well. 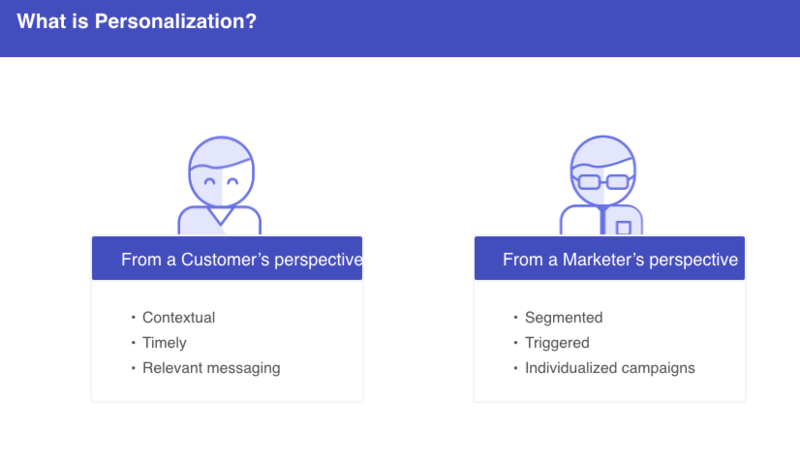 That hyper personalization case study is available online on you’ll actually be able to read through much more details about it. We have got an hyper personalization explainer video on our YouTube channel on this subject. There’s a little more content that we’ll share with you so after this webinar is done we’ll be sharing these resources with you. But basically, this is it. This is all that we wanted to convey and I think I’ll hand it back to Avantika now. Avantika: All right, thank You, Sameet. Let’s start with the Q&A session. We’ll give you a minute to type in your questions and we’ll attend to them shortly. Avantika: All right, guys. We’ll start addressing the questions now. Thank you, guys. You have been sending us plethora of questions and if we are not able to address any of yours, we’ll reach out to you personally. So, Sameet, let’s start. Sam wants to know, does WebEngage perform a reverse IP look up? Sameet: Okay, thank you, Sam, for that question. So WebEngange does anonymous user profiles. Your users don’t have to be logged in in order to be profiled by the WebEngage. There is session data that we capture including IP but today we’ve not gone as far as to reverse IP lookup and try to basically realize where or which account or which company the customer may belong. So if you are coming from the account-based marketing world, I would say today we don’t do reverse IP lookup. Maybe this is something we’ll look into in the future. But, yes, the IP information is captured at the. Avantika: I hope that answers your question, Vishwambard wants to know, can personalization be done at IP level, specific messages to show to users from certain IP list? Sameet: Thank you, Vishwambard, for that question. A lot of IP related questions, I see, and that’s all right. So can personalization be done at an IP level? Yes, so the thing that you’re trying to do is you wanna send a specific set of messages to or people from different geographies or different IP ranges and that is possible. The means to do that is segmentation. So I think that’s a topic that’s a whole another topic in itself. But, yes, you are able to segment your users on the basis of criteria including IP ranges and you can target specific messages to specific IP sets. Avantika: Samuel wants to know, conditional branching in Nunjuck, not in your Flow Painter? Sameet: Conditional branching in Nunjucks, not in your flow painter? If I understand the question correctly, you’re saying Nunjucks has a capability to do conditional branching, whether that is a part of our journey is what you’re asking. So any capability that you brought in Nunjucks is available to you for use for content personalization. So whenever you’re typing a new message, whether it be the email body, or the subject, or a push notification, button level, wherever, you can use Nunjucks templating and all the constructs that it offers. So or anything else. But the purpose there is to branch and conditionally personalize the data block that would go in that space and not necessarily the workflow itself. It could basically be used to personalize the content of. Avantika: Okay, so Miraj wants to know how this works for web notification or personalization on websites. Sameet: So thanks, Miraj. Miraj, the best part about this personalization engine that we is that it’s an engine. We’ve not tied it to all per se. We’ve tied it to stand on its own feet and it’s available across all the means of engagement that is caught. So the human is pretty much your friend across web notifications and your website. Avantika: Okay. Rahul Data wants to know, can we use image apart from the logo in the push? Sameet: Okay, so yes, when you send a web push, you are able to customize the smaller image that gets attached to that particular web push that is going. Okay, if you’re talking about the larger, richer web push notifications, the way you can do them in the mobile push world where you can actually embed a larger image below the message, that capability is available in the web push technology. It’s just not compliant which is why we don’t have it in our suite yet. But, yes, that is something which is on the roadmap and should come out in. Avantika: Okay, another question from Vishwambard, can we do personalization on the basis of user journey flow? If a user has reached a page from page A then page B, can I personalize the message on page C depending on the content viewed on A and B? Sameet: Good one, Vishwambard. And the answer is absolutely. You seem to be user. We should talk offline. But, yes, any behavior that the user is expressing, if you wanna use that to personalize your target subsequently, you have the capability to do it. For example, you’re saying that can message on page C depending on the content viewed on page A and B. So the prerequisite is that viewing the content, viewing of certain section, is a behavior that you are interested in. That is something that you will have captured so when the user views page A and page B or a certain section of it, you would trigger an event. You would capture some metadata around that event. And subsequently when the guy reaches page C, you will have the latest occurrences of the ones that on page A and B. You would be able to personalize your content. Avantika: Vishwambard, if you have any other question you can please feel free to connect with us offline and we’ll be more than happy to get on call with you. Okay, Chan Chun wants to know, I’m trying to hyper personalize notifications based on people’s activity and we are having a hard time to do that. I think we need architecture level help to provide data to WebEngage. Sameet: Chan Chal, we are more than happy to help you on this. Please connect with us after the webinar and we’ll be happy to take up your case. So as you’ve seen, the personalization engine, the human basically makes it as easy for you as it is to point and click and that’s it. So the whole heavy lifting has to be done at the time of integration and making sure that the right data is being passed, the ones that you anticipate using, and our team can certainly help you in that scenario. Avantika: Another question from Savio. Does the platform manage landing pages from these campaigns? Sameet: We don’t have the capability to build landing pages yet, Savio. You will be able to link to any of the landing pages that you want but to answer your question straight, our suite as on date does not allow you to build a landing page. Okay, guys, we’ve got a ton of other questions, too many to handle. So I think we’re gonna reach out to you individually to address all of those. Let’s just take a last one. Avantika: Give us a moment. Sameet: We’ve got a very interesting question here by Ruwan Ruwall. He’s talking in the context of the example that we gave. And Ruwan, kudos to you to sort of identify the shortcoming in that example. For the interest of everybody’s benefit, I’ll read that out. If the seats left data, so if you remember we use this on the three tickets available, right, so if that data is fetched in real time to an API or is it coming to an event. That’s the question that Ruwan is asking. Because they showed you that it came from an event, the inventory could change, right? If they actually use the data from the event that happened in the past, other bookings would have happened and the inventory would eventually change. So Ruwan has actually answered the question the question itself. So he said, do you do it through an event or you do it through? So the recommended way or the preferred way, the most optimum, the most to do it if that is too cumbersome for you to set up, and so the API would basically be an endpoint where we would ping you with, say, the flight number or the departure-arrival combination and you would respond with JSON data that would contain three or two or how many seats were left just before sending the email. So that would be extremely optimal. I give it to you. If that is not possible still, in case that is too cumbersome a set up for you to do, you could still the extent of embedding that data and event and contextualizing the message and grab attention and drive action. But, yes, the correct way to do it is the way that we suggest. So guys, I think that’s a lot of questions that we still have pending. We’re gonna reach out to you individually. Back to you Avantika. Avantika: Thank you, Sameet. Thank you so much for the presentation and thank you everyone for joining us. You guys have been great. Please don’t forget to take out a moment to complete our survey which we’ll be sending out along with the email and we’ll be sending you the recording, some of the other resources on personalization we have and also answering your queries. All right, thank you so much and have a great day. Bye-bye.